We stand behind our quality of service with our 2-tier 100% customer satisfaction guarantee. We will provide the quality of service we promise. Our service will meet or exceed industry standards every time. If we fail to achieve the results we promise, our fees will be reduced or completely waived. We will never surprise customers with unexpected charges. The customer will never pay more than the price agreed upon at the time work begins (unless customer asks for additional services). 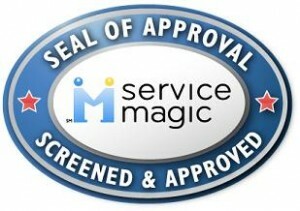 Our guarantees are further backed by our status as a 5-star Service Magic member….